Cat claws hurt. If you have an elderly cat who is less fastidious about grooming than they used to be, or an indoor cat who doesn’t have many scratching options available, then they might need a little help trimming their claws. Claws should be long enough and sharp enough to do cat stuff, but not so sharp that they draw blood from people. Keeping your cat’s claws at a suitable length also helps avoid them getting snagged in fabric or on toys, which can cause significant distress to your cat. Ideally, you should get your veterinarian, or a professional groomer, to show you how to clip your cat’s claws the first time or two, until you feel confident doing it for yourself. The general rule is that you only ever take the very tip of the claw off, and you should ensure you have someone who is able to hold what is likely to be a very angry kitty still and secure as you clip. While these clippers are affordable, they are uncomfortable to use, and best suited to young kittens – on older cats, they do not always give a clean cut. In terms of durability, these clippers last reasonably well for the price. Suitable for all cat breeds, these clippers feature a non-slip rubber grip. They are affordably priced, and cut cleanly, without splintering fine claws. However, the handles are somewhat small, and therefore can be uncomfortable for those with larger hands. 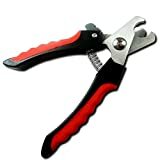 The semi-circular blade on these nail clippers makes it easy to see the nail as you cut, and easily fits between the nail and the foot, providing a safer cutting experience. The rubber grip is comfortable for most people, and the clippers cut cleanly, with minimum stress for the cat. 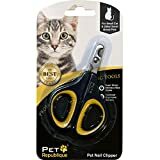 These nail clippers include a protective guard, to help avoid overclipping your pet’s nails, and to keep from cutting the quick – the small blood vessel that runs close to the end of the claw. The design of these clippers means you will automatically be in the most comfortable position whilst using them, which makes the whole task that much easier. These clippers cut cleanly, and do not splinter the claw, which is a risk when trimming cats’ claws, as they are much finer than dogs’. These are reasonably priced, and work well for rabbits, ferrets, and birds, as well as cats. 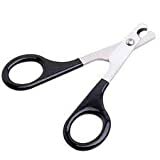 While these may be a little small in the grip for some humans, they cut cleanly on cat and dog nails, and come with a cutting guard, so you can be sure of not cutting too close to the quick. They are more suited to larger cats, as they are a little bulky. However, one bonus, especially with cats, is that the blades close very softly, so kitty isn’t startled by the sound of metal snapping closed. 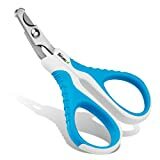 These are ideal for getting claw clipping over and done with quickly and painlessly. All told, we think these are the best nail clippers for cats. 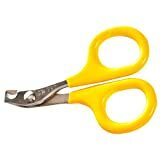 Small animal & pets toenails cutters - scissors for breeds with thick or thin claws. Specifically designed to be used safely on medium and large size dogs. If you are in any doubt about cutting your cat’s claws, or you have a particularly feisty kitty, it is best to have a veterinarian or professional groomer take care of it for you. Also, expect some indignation and sulking on the part of the cat afterward!